Long ago there lived three fierce warriors. From the Kingdom of Backyard came Rock; from the Empire of Mom's Home Office came Paper, and from a messy village in the Junk Drawer Realm came Scissors. They were the strongest, smartest and fastest in all the land. Though they searched far and wide for worthy opponents, no one could beat them ... until they met each other and a musical battle royale began to see who would come out on top. 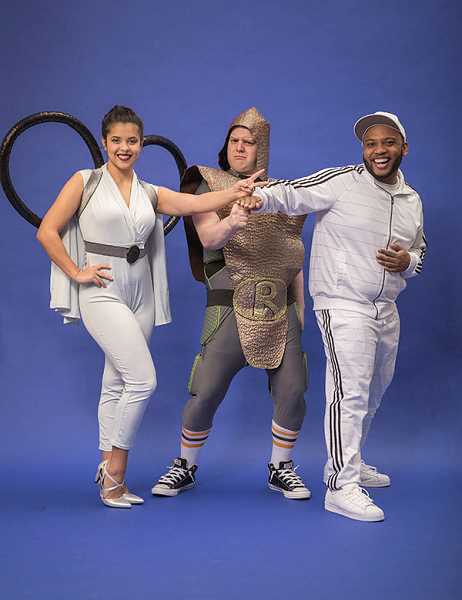 Based on the best-selling children's book by Drew Daywalt, "The Legend of Rock, Paper, Scissors," was co-commissioned by Oregon Children's Theatre and First Stage in Milwaukee, Wisc. "I chose 'The Legend of Rock, Paper, Scissors' because this book is laugh-out-loud funny," said Stan Foote, Artistic Director for OCT. "I grew up playing the game and the legend is all the more fun because it is part of our common human history. The final production will be as vibrant and funny as the source material." First Stage and OTC have partnered on many projects, but this is the first pairing of a local composer, Eric Nordin, associated with OCT, and playwright John Maclay, associated with First Stage. "When adapting the book, I found it to be very much like a collection of comic book heroes," says Nordin. "Each of the many characters has their own personality, style and skills. I explored the idea that each should have their own musical influence as well. For example, Rock is patterned off classic rock & roll, Paper is patterned off dance pop music like Michael Jackson, and Scissors is patterned off a Latina pop star in the vein of Jennifer Lopez." The ensemble cast features Dave Cole, Janelle Rae Davis, Alec Cameron Lugo, Rob Lauta and Tara Velarde. The creative team includes OCT's Stan Foote as director; Eric Nordin as composer and musical director; Kristen Paige, choreographer; Jon Kashiwabara as set designer; Emily Horton as costume designer and wardrobe manager; Sarah Hughey as lighting designer; Phil Johnson as sound designer and Robert Amico as props manager. Before every performance audience members are welcome to come an hour early for a pre-show activity, and after every performance they can meet the cast, take photos and get a playbill signed. Saturday, March 9 at 2 p.m. the performance will be interpreted in American Sign Language. March 9 is also Scout Day; tickets for scouts are 20 percent off and fun patches are available for purchase for $2 each, with advanced orders. All shows March 9 will feature Steve and Kate's Camp, with fun activities before both performances. Showtimes are 2 and 5 p.m. Saturdays, and 11 a.m. and 2 p.m. Sundays. Performances take place at the Winningstad Theatre, 1111 S. W. Boardway in Portland. Tickets range in price from $20 to $3 for adults and $15 to $28 for children. Call 503-228-9571 or visit octc.org to purchase tickets.